Spyro the Dragon was first released on the original PlayStation in 1998. It was followed by two sequels, Spyro 2: Ripto’s Rage and Spyro: Year of the Dragon in 1999 and 2000, respectively. This awesome trio of platforming video games followed the adventures of Spyro the purple dragon, as he explored a huge variety of levels and environments to defeat enemies and complete specific goals, all while collecting large amounts of treasure. These three games have been remastered (like Star Wars) in Spyro Reignited Trilogy, which is now available on PlayStation 4 and Xbox One. What is the Spyro Reignited Trilogy? Spyro Reignited Trilogy is a remastered collection of the first three games in a single package. Each game has been given a complete visual overhaul, transforming rather empty (but still colorful spaces, for the PlayStation 1) into jaw-dropping worlds with tons of new details and rich, vibrant colors that make them feel alive. In all three games, players must complete a variety of themed levels, making their way from a starting point to an end point while defeating enemies and collecting gems. Players need to do lots of jumping and gliding to make it from one platform to the next, which tests their reflexes if they want to see and do everything each stage has to offer. 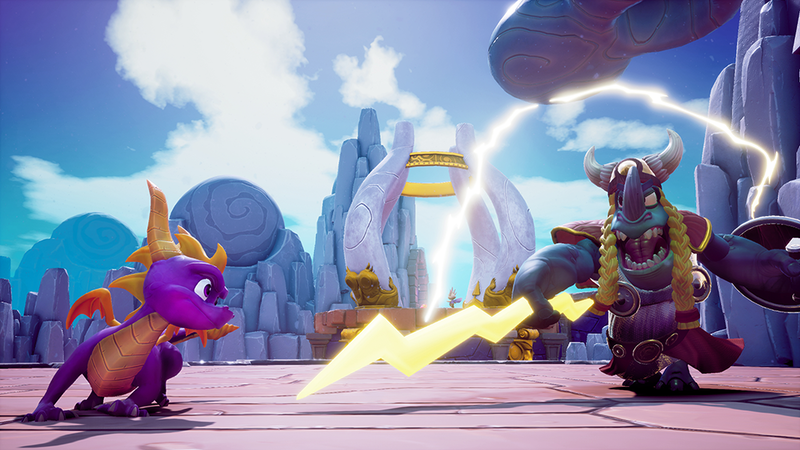 Spyro 2: Ripto’s Rage and Spyro: Year of the Dragon add new features to the formula created with the first game, giving players more to do. Let’s break each game down one by one. In Spyro the Dragon, Spyro and his loyal dragonfly companion Sparx must rescue Spyro’s dragon friends, who have been turned into statues by the evil Gnasty Gnorc. Spyro 2: Ripto’s Rage follows Spyro and Sparx on their adventure in the magical land of Avalar, where Spyro is recruited by Elora (a faun), Hunter (a cheetah), and a character named the Professor to save the world from the evil Ripto. This time around, Spyro can learn new abilities, such as how to swim and climb walls (in the first game, water is a hazard). 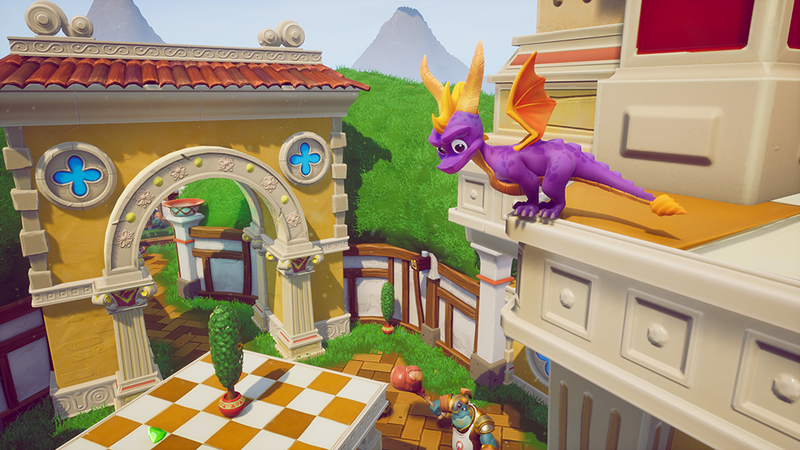 While levels in the first game can easily be completed to 100 percent the first time through, in Ripto’s Rage, certain areas will only become accessible once Spyro learns specific abilities. Players will need to revisit stages multiple times in order to do everything, much like they need to replay stages in a modern Lego game. 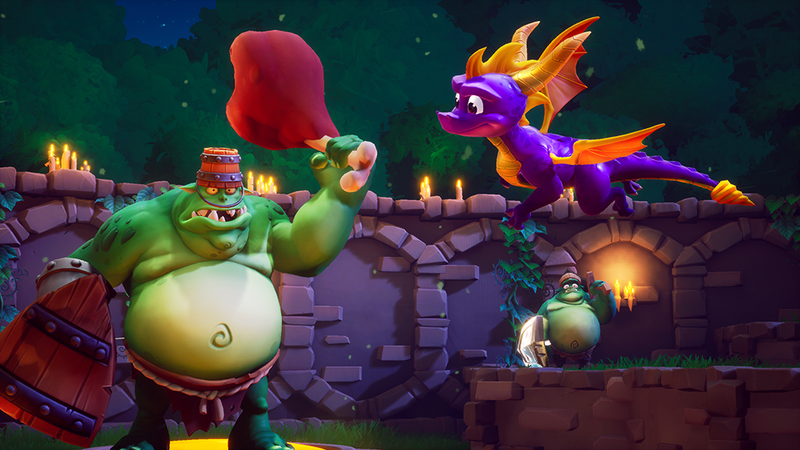 Ripto’s Rage also adds secondary quests to each level, allowing players to complete objectives of varying difficulty levels for the local citizens to collect rewards. Finally, in Spyro: Year of the Dragon, Spyro (again accompanied by Sparx) must recover the dragon eggs that have been stolen by the evil Sorceress. Year of the Dragon introduces additional playable characters to the mix, each with their own abilities. 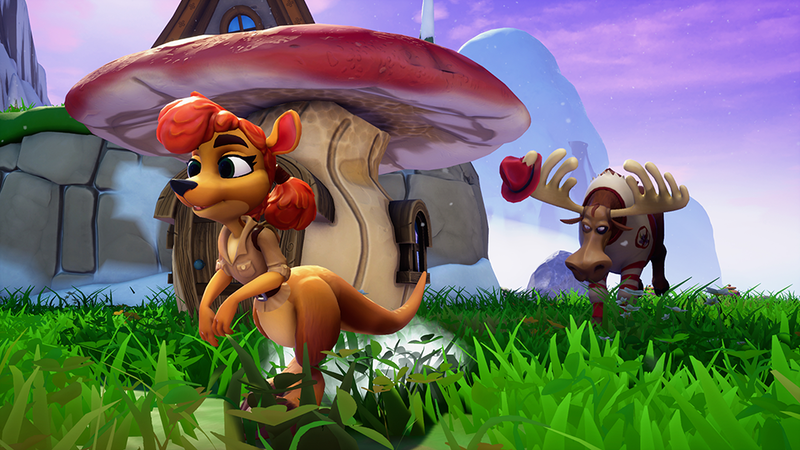 For instance, Sheila the kangaroo can jump much higher than Spyro. The game even lets users play as Sparx in challenging top-down shooter levels. Collecting gems plays a big role in each game. In the first game, players will need to collect a required number of total gems to unlock passage between a few of the game’s hub worlds. 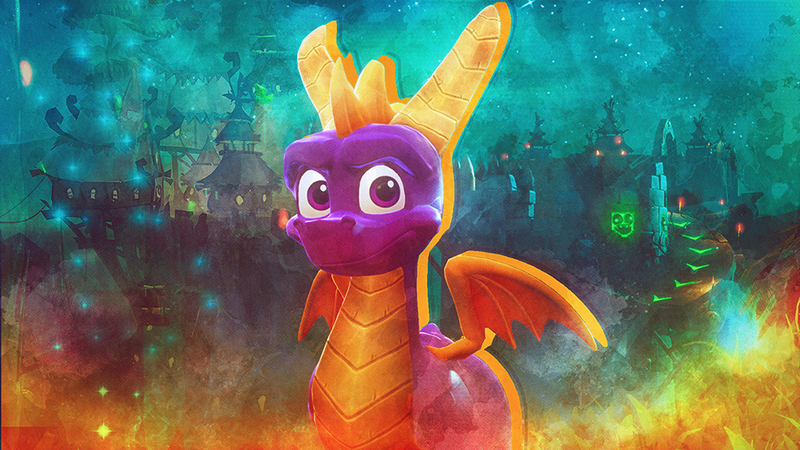 In the second and third games, players will frequently need to collect the required number of gems to pay off Moneybags, a character who will charge Spyro to access bridges, unlock new skills (in the second game), and more. While some gems are easy to find, it becomes a real challenge when trying to collect everything in every level, due to the inclusion of hidden areas, platforms that can only be reached by performing challenging jumps, and more. While each level contains its own unique enemies, most every enemy falls into one of a few main groups, in terms of how they’re defeated. Small, normal enemies (those without armor) can be defeated by either charging into them or blasting them with Spyro’s fire breath. Large enemies can only be defeated with fire, and finally, any enemy wearing shiny armor needs to be defeated with a charge attack. There are only a few exceptions to these standard types, and the combat remains the same through all three games, so once kids pick up on the rules, they can take out anything in their path without having to memorize complex strategies. That isn’t to say these game are easy. Levels often contain enemies that are bunched together in small spaces, requiring quick presses of both the charge and fire button to take out each in the appropriate way before Spyro gets hit. In all three games, Sparx serves as Spyro’s health meter. He starts out gold, but turns blue and eventually green before disappearing entirely as Spyro takes damage. Players can recharge Sparx’s power by defeating harmless critters in each stage, like sheep or rats. However, if players take a hit while Sparx is missing, they’ll lose a life and will restart at the last checkpoint they passed (there are lots of these, so players won’t lose too much progress even if they die). Are these games ok for young kids? The Spyro Reignited Trilogy is rated E10+ by the ESRB, with content descriptors for “Cartoon Violence” and “Comic Mischief.” While the content is appropriate for youngsters, the youngest players will likely find it challenging to see and do everything in every level without your help. Each game also contains a series of flying levels, which ask players to do things like fly through rings, destroy explosive barrels, and more before running out of time. These levels are incredibly challenging even for adults -- far more so than we remember them being back in the day. Thankfully, players will only need to master these stages if they’re going for total completion, and they can retry as many times as they need in order to finish them. While kids may find completing each game to 100 percent a challenge, the pros far outweigh the cons. For one, players aren’t required to collect everything to beat each game, so if your kids aren’t interested in being challenged, they can skip the more difficult parts. In addition, a helpful mini-map can be activated in the corner of the screen, which will show players their current location so they can avoid getting turned around. Finally, the games have full voice acting, and most dialog is accompanied by subtitles (though there is no subtitle option for the cutscenes), so kids can practice reading along as characters speak. One last thing to note: In Spyro: Year of the Dragon, a few levels contain a skateboarding mini-game that’s way more fun than it has any right to be. Players can spend hours mastering all of the skate tricks to try and top their high score, so there’s always something to do. Spyro Reignited Trilogy is a colorful, charming, and delightful experience for players young and old. Older players can challenge their skills by trying to reach 100 percent completion, while youngsters can have a blast shooting fire at sheep and running around each semi-open world. Whether you played these games when you were younger, or will be experiencing them for the first time with your kids, these are classic games reborn that (with the exception of some flying stages) are just as fun now as they were the first time around.